Micah Wilkinson began his trumpet studies in sixth grade in Atlanta and went on to graduate from St. Olaf College in Minnesota. He pursued additional studies at Arizona State University and the Staatliche Hochschule für Musik in Freiburg before embarking on an orchestral career. He held positions with the Houston Symphony, the San Francisco Symphony, the Oregon Symphony and the Tucson Symphony, and served as Principal Trumpet with the San Diego Symphony for three years before being appointed Principal Trumpet of the PSO by Manfred Honeck, beginning his tenure in January 2018. 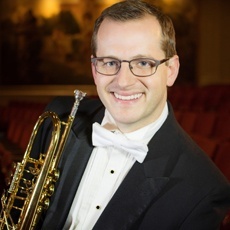 Micah was a featured artist at the 2017 International Trumpet Guild Conference in Hershey, PA, and he is an accomplished teacher, clinician and chamber music coach. In the summers he serves as a teaching artist at the Round Top Festival Hill Institute in Texas. - Or you can bring your own brown-bag lunch! If you would like to receive future program announcements, please drop us a line at: PSAmusic101@pittsburghsymphony.org (your email address will only be used by the PSA). visit www.pittsburghsymphonyassociation.org or call 412.392.3303 for more information.